Jabberwock: "An essential moment, beyond all the formal planning"
"An essential moment, beyond all the formal planning"
A few days ago I saw an old Alfred Hitchcock interview in a documentary titled “The Men who Made the Movies”. Among other things, the Master discusses his method of preparing such sequences as the shower killing – made up of 70 “pieces of film” – in Psycho. In this light it’s notable that one of Hitchcock’s greatest champions, the critic Robin Wood, admitted late in his life that for all their artistry, Hitchcock’s movies “went dead” on him more easily (when he re-watched them for the umpteenth time) than, say, the movies of Howard Hawks, who was much more open to improvising with his actors and crew. 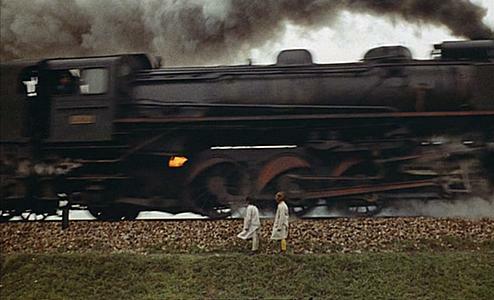 But by that logic, Victor Erice’s 1972 Spanish film El espíritu de la colmena (The Spirit of the Beehive) should be dead on arrival; this is a movie made so meticulously and self-consciously – with so much attention to the composition of nearly every frame – that it makes Hitchcock’s work seem laidback in comparison. 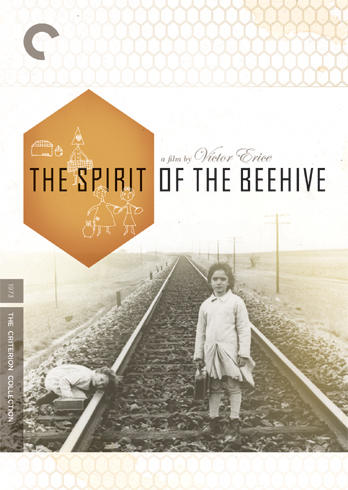 While The Spirit of the Beehive is a very beautiful film to look at (especially in the Criterion Collection transfer), it also has a cold and detached quality that makes it easier to admire from a distance than to take to one’s heart. Its narrative is a series of discrete episodes about the many terrors and wonders of childhood – beginning with a little girl’s discovery of cinema. 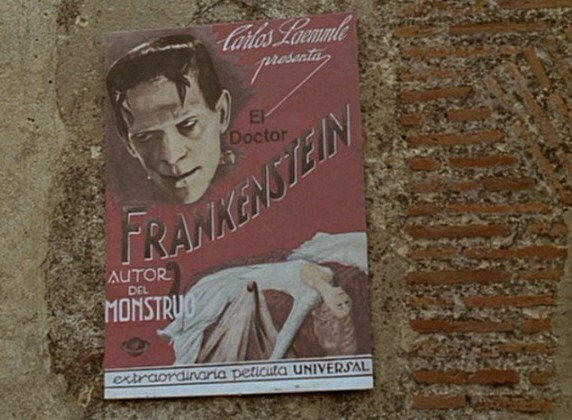 In a makeshift screening room in her small village, six-year-old Ana watches the 1931 Frankenstein along with other children. “I would advise you not to take the film too seriously,” director James Whale warns the audience in the pre-credits introduction, but Ana is traumatised by what she sees– and her elder sister Isabel makes it worse by telling her the monster really exists. The Spirit of the Beehive is a slow-paced film and Erice exercises tight control over his mise-en-scene and his symbolism. (For example, the bees – operating with mechanical precision – can be seen as representing an efficient yet emotionless society; Spain was under Franco's dictatorship at the time.) When I first watched it, it took me a while to understand the principal relationships, even though the family consists of just four people: the beekeeper, his wife and the two little girls. Soon I realised that this was because Erice deliberately avoids showing all the family members together, even when they are in the same room. One vivid scene with the four of them eating together at the dining table, but no two of them ever in the same frame, has the remoteness of the spacecraft scenes in 2001: A Space Odyssey – it creates a distancing effect that’s central to the story. And yet, this most carefully planned of films contains a single spontaneous shot, lasting just a couple of seconds, that shows us the precise moment when little Ana’s interior world becomes filled with dread. She is watching the scene in Frankenstein where a little girl offers a flower to Boris Karloff’s monster. Completely immersed, Ana leans forward slightly and moves her head for a better look; her mouth opens a touch. How pleasing it is to learn that this wasn’t a rehearsed scene. 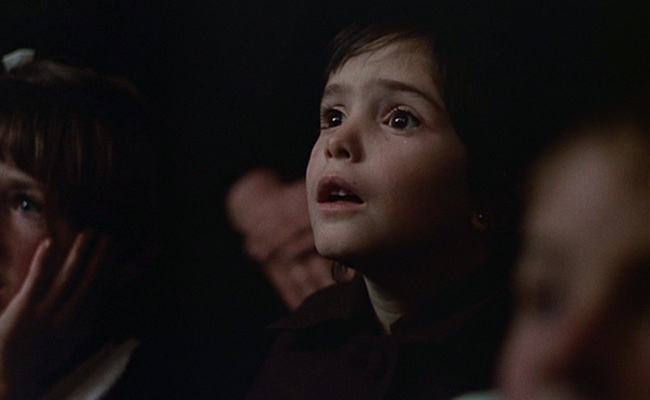 Luis Cuadrado, the cinematographer of Spirit of the Beehive, was sitting on the floor in front of his young performer, holding the camera in his hand (and handheld shots are not the norm in this film! ), recording her expression as she really watched Frankenstein for the first time. What he captured was a completely artless reaction: by all accounts, the real-life Ana Torrent (who played Ana) was just as affected by Karloff’s monster as her character was supposed to be, and the experience of shooting The Spirit of the Beehive remained a disturbing memory for the actress well into adulthood. In other words, that shot is a meeting point between film as a medium for fictional narrative and film as a record of reality. Coming from a director who was known for his fastidiousness, I find this admission both moving and illuminating. It’s almost as if one of those worker bees broke away from its hive-mates for an instant and danced a little jig by itself, before getting back to its regimented work. P.S. For all of Hitchcock’s careful pre-planning - and his occasional treatment of actors as chess pieces - it would be naive to imagine that his movies contained no improvisations or on-the-set additions. Watch the intense sequence in Psycho where Norman Bates (Anthony Perkins) is interrogated by Detective Arbogast (Martin Balsam) and you have a classic example of two Method actors improvising as they go along, playing off each other’s reactions in a way no director could possibly have foreseen. And despite Hitchcock’s supercilious attitude to actors (“they ought to be treated as cattle”), Perkins has said that the director was very open to his suggestions, such as the idea of having the nervous Norman perpetually chewing candy. Perhaps old Hitch wasn’t as averse to film sets as he would have us believe. Wow, one of your best pieces that I've read. Cheers! - The Hitchcock school that emphasises control and formal planning and eschews improvisation to the extent possible. Careful scripting, short cuts and montage are some of the other features of this school. - The Renoir school which favours improvisation by actors, realism and longer takes. Then, you've got some extraordinary directors like Ford, Scorsese and Altman who defy categorisation and exemplify the best of both the schools! To my mind, the most archetypal Hitchcock film is Suspicion - a most underrated feature. It fascinates me with the way Hitch carefully manipulates the audience's emotions with his clever cutting and juxtaposition of scenes. The most atypical Hitchcock film is Trouble with Harry - a movie that reminds one of Renoir more than Hitchcock! Though I love Hitch a lot, I have to agree with this observation! One can watch the first 15-20 minutes of Only Angels have Wings a zillion times without tiring of it. The casual banter between the pilots and Jean Arthur is so completely bereft of artifice that one wonders if they are just normal people unwittingly caught on camera by a casual onlooker. And yet, there is an auteur at work behind the unassuming camera. It's a film that makes very perceptive points about death, friendships and the conflict between personal and professional lives with the minimum of fuss. Isn't he the one who said that there are three things you need to make a film - a good script, a good script and a good script? Vidyut: who do you mean by "he"? Victor Erice? Hitchcock? That doesn't sound like the sort of thing either of them would say, if you define "script" in its narrow sense, as the story and the dialogue. But if you broaden the description to mean the storyboarding in general - including shot composition, etc - then it makes more sense. Shrikanth: even with your qualifiers "broadly speaking" and "roughly", I'm not comfortable with dividing directors up into two categories. I just don't think it works that way. There's a whole continuum, with plenty of overlapping, and directors who have long careers tend to move along the continuum a lot. Interesting observation about Trouble with Harry being Renoir-like. It certainly has the lush look of some of Renoir's colour films, but I think it's just as tightly controlled as most of Hitchcock's other work. I make feature films. I have some idea of the process. Any film - good or bad, whether with a detailed shooting script or without a script - will have its moments of happenstance. Spielberg commented he waits for these moments to happen. It has happened with me...the most planned and thought about scenes go flat and you suddenly get a shot or a scene or a moment which is unique and fresh. Some of the best remembered scenes from my films were pure happenstance. I had no part to play. I was at the right place at the right time. And that's the beauty of cinema. Our mainstream films include such moments...but mostly created by actors from their repertoire. 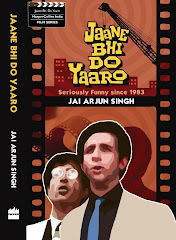 Comedy actors are a good example...from a very broad sketch of a character, they will create interesting moments which stand out from the rest of the film. Jai: Yes. It was a rather gross categorisation. But there are several directors who you can clearly bucket into one of the two categories. I think, instead of identifying the two categories with Hitch and Renoir, we can label them as the "Hollywood narrative school" and the "Continental school". I get a feeling that the adherence to formal planning, careful scripting and plotting is more characteristic of Hollywood films than films made elsewhere. Just a personal observation. But still it is by no means a perfect classifier. You've directors like Hawks who is closer in spirit to Renoir than say a Hitchcock or a Wyler. Anon: Your comment reminds me of William Wyler - a director notorious for his umpteen repeat takes hoping that something accidentally brilliant will occur in the nth take! Jai, Are you implying a correlation between the planning done by a director and the impact on it to the viewer? I don't see how that could be the case. A movie can be meticulously planned to be subjectively interpreted. Rahul: didn't really get the question. Of course all movies can be subjectively interpreted - and this is regardless of how meticulously planned they were. What I'm talking about in this column is the extent of control a director maintains over a film, in terms of being open to last-minute improvisations, seredipitous moments, etc. In case you're talking about this bit: it also has a cold and detached quality that makes it easier to admire from a distance than to take to one’s heart, that is of course my subjective reaction to the film. 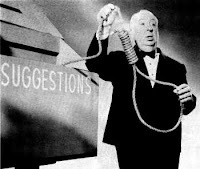 "In this light it’s notable that one of Hitchcock’s greatest champions, the critic Robin Wood, admitted late in his life that for all their artistry, Hitchcock’s movies “went dead” on him more easily (when he re-watched them for the umpteenth time) than, say, the movies of Howard Hawks, who was much more open to improvising with his actors and crew.."
I may be wrong but what I got was an implied correlation between "movies going dead" and the openness of the director to improvise. what I got was an implied correlation between "movies going dead" and the openness of the director to improvise. Rahul: reverse correlation, you mean? (Wood was implying that Hitchcock's films went dead on him more easily because they were so tightly controlled, didn't have much breathing room, etc.) Again, this wasn't intended as a statement of fact, just as a reporting of what Wood said (and he himself wasn't sure about the correlation anyway). As I wrote in the very next para, by that logic, Spirit of the Beehive should be dead on arrival - which it certainly isn't as far as I'm concerned, even though I struggle a bit with some of its formal perfectionism. Yes, thats what I meant, Jai, and point taken, thanks! Jai, I met Victor Erice yesterday at the Berkeley Pacific Film Archive. He was there to introduce SotB. Very understated & polite person. He patiently answered everyone's questions. He doesn't speak English, & had a Spanish to English interpreter with him. He also emphasized a few times that the film was not 'premeditated', which would give some context to some of the comments above. I had printed out this post & gave it to him. Told him a friend of mine is a big fan :-) He promised to read it & asked me to thank you for writing this.